Ready or not, nurses entering the profession at every level will be expected to take on leadership roles. In complexity leadership, the style is transformational, self-reflective, collaborative, and relationship-based. The Personal Being and Awareness component includes the use of self-reflective and self-care practices for mind, body, and spirit. Distancing oneself from linear leadership and employing complexity leadership can require personal strength, courage, and self-awareness. The excerpt below is directly from the text, Complexity Leadership: Nursing’s Role in Health Care Delivery. 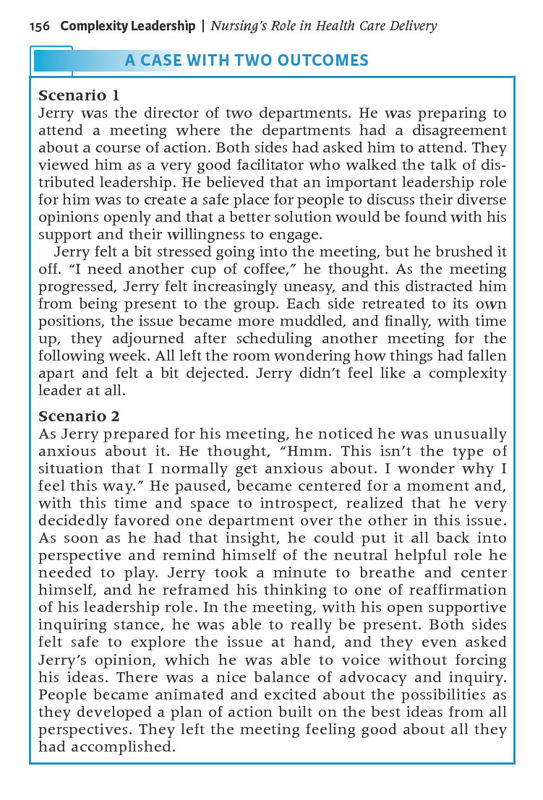 The two scenarios involving Jerry illustrate the immediate consequences of Jerry’s behavior and allude to the long-term effects in a collaborative health care setting. From Complexity Leadership by Diana M. Crowell, ©2011, F.A. Davis Company. All rights reserved. Have you faced situations where you employed complexity leadership in your career? Tell us your story in the comments! ← Health Care Link Roundup: Nurses Week Edition!